“It’s a song about taking the risk to do what you love,” Alice Wallace says of the soaring track, “The Blue,” which yields a lyric entitling her spellbinding new album. With Into the Blue, the California-country singer-songwriter conjures the atmospheric sound of the Golden State’s canyons and deserts, mountains and crashing waves, its crowning beauty and its tragic losses. At the same time, the supple-voiced Wallace tells her own and others’ stories, weaving tales that resonate as we grapple with so many disturbing national issues. It was after Wallace’s return to her birth state of California that she fully embraced her calling as a singer-songwriter. Her musical family had relocated to rural St. Cloud, Florida, when she was a child. She grew up around the sounds of her parents playing guitars and singing, with “Gram Parsons and Emmylou Harris, their favorite,” she recalls. She also absorbed the country rock of ‘70s-era Linda Ronstadt on the turntable. “I really taught myself to sing by mimicking their styles,” she says. “The powerful belt that Linda has. The emotive lilt to Emmylou’s voice. Trying to navigate those different elements helped me find my own voice nestled in between all that.” She first picked up guitar at age 10, with her dad teaching her to finger-pick at 15, and by senior year in high school, Wallace was performing original compositions at the local Borders bookstore. It was in college that she discovered yet another calling: yodeling, that haunting vocal style that blends blues, country, and western. Wallace’s own “A Little Yodel” added her to the ranks of legends Patsy Montana and Carolina Cotton. In 2008, when the Wallace family relocated back to Southern California, she joined them. There, she began focusing on writing, performing, and touring, both solo and with a band. Since 2013, she performs some 200 dates a year. One of those with whom she’s shared stages is singer-songwriter Ray Wylie Hubbard, who says she and her “stunning” songcraft have that “Steve McQueen ‘Cincinnati Kid’ cool.” Pundits agree: she won the 2017 Female Vocalist of the Year at the California Country Awards and the previous year’s Best Country/Americana Artist at the L.A. Music Critic Awards. She was recently singled out by the Los Angeles Daily News and Pollstar for her “dead-on lovely version” of Ronstadt’s “throbbing” “Long Long Time” at the “Palomino Rides Again” event celebrating the legendary California honky-tonk. Into the Blue represents Wallace’s evolution as a recording artist, showcasing her growth as a songwriter as she embraces a fuller sound, backed by some of Americana’s most distinctive players. Co-produced by Steve Berns and Rebelle Road’s studio veteran, songwriter and musician KP Hawthorn (who’ve made a name for themselves working with artists in the West coast Americana scene), the album is brimming with soul. The formidable rhythm section, including drummer Jay Bellerose (Bonnie Raitt, Elton John, Aimee Mann) and bassist Jennifer Condos (Jackson Browne, Graham Nash), underpins instrumentation ranging from Tom Bremer’s crunchy electric guitar to Kaitlin Wolfberg’s lush string arrangements to keys and pedal steel from Jeremy Long (Sam Outlaw). Wallace uses an intoxicating array of vocal styles to bring her songs to life: a dusky alto on “The Lonely Talking” (co-written with KP Hawthorn); gospel-tinged belting on “When She Cries” (inspired by the end of a six-year drought in California), and a soaring soprano on “Santa Ana Winds.” The latter, a country-rock chronicle of California’s devastating wildfires, is a co-write with Dallas artist Andrew Delaney, a frequent collaborator whom she calls “the most brilliant lyricist I’ve ever met.” Wallace inhabits his stirring “Elephants,” giving voice to women who refuse to be “quiet as a mouse in a room full of elephants.” The Wallace-Delaney-penned “Echo Canyon” is, she says, “a southwestern cowboy ballad that’s a modern take on a yodel song.” Wallace’s heart-wrenching “Desert Rose” tells of a young mother’s struggle to give her baby a better life across the border. Lyrically, the heart of the album is the luminous anthem, “The Blue,” says Wallace. It describes her own journey to “get over my fears and go for the thing I love the most.” She knew that being a traveling troubadour and committing herself fully to music could be a dangerous choice. “In some ways, I wish I had done it sooner,” she says. “But I’m also glad I have the life experience to help fuel my songwriting and survive life on the road.” The highly charged emotional feel of “The Blue” derives in part from its exquisite layered harmonies – Wallace’s vocals joined by those of her father, mother, and brother. Known as “blood harmony,” when kinfolk sing together, it conveys a rapturous kind of purity and strength. 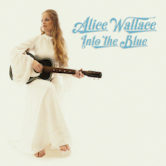 That buoyancy radiates throughout Alice Wallace’s Into the Blue, lifting her listeners up, transporting them into the world of a seasoned troubadour looking back from a dream realized and dues paid without regret.